Children from local schools will make at least two visits to the Alhambra Theatre in Bradford to see a selection of shows as part of the Start programme during their first year of the programme. They will then work with the team at the Alhambra Theatre in workshops to develop their critical eye and have fun creating their own artistic work, with plenty of opportunity to celebrate their achievements at the end of each year. The next school visits are linked to the Alhambra Theatre’s lavish pantomime, Cinderella, which is an ideal genre as a first introduction to theatre, with its relaxed atmosphere and opportunity to join in. The Alhambra Theatre’s name is synonymous with pantomime. Francis Laidler, who built the Alhambra Theatre over 100 years ago, was known as the King of Panto and for half a century, he delivered panto after panto in his Bradford venues, as well as venues in Leeds, Keighley, Manchester, Bristol and London. The three local schools which will be participating in pantomime-themed activities and bringing students to see the panto at the Alhambra Theatre are Hill Top CE Primary School, Southmere Primary Academy and Bradford College. Hill Top CE Primary School will bring students to see Cinderella in January and while at the venue they will also participate in additional activities in the theatre. The students will also enjoy additional activities in school earlier that week, with an Active Techniques workshop led by Julia O’Keeffe, Learning Coordinator for Bradford Theatres. This will be English curriculum based and linked to pantomime, including storytelling, modern fairy-tales and characters. "At Hill Top we really value the contribution the Arts make to the development of the whole child and we are really excited and enthused by the opportunities that this project will create for not only our children, but the whole school community. We look forward to working alongside the Alhambra Theatre and other creative professionals and developing a sustained relationship to inspire and motivate our children and enable them to see that they can get a lifetime of enjoyment from, or even have a career in, the Arts." Southmere Primary Academy will also be participating in additional activities in school; again these will be English curriculum based including active techniques, storytelling, history of pantomime and characters. 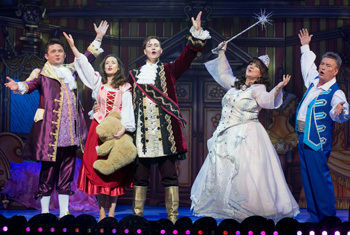 The students will also get to see the pantomime in January, and stay for a post-show Q&A with cast members. "At Southmere Academy we believe that drama and oracy incorporated into the wider curriculum will allow our pupils the opportunity to embed and develop key skills in reading, writing and impact positively on pupils’ confidence and self-esteem. Participation in this project will bring the magic of live theatre to pupils and is sure to inspire them." Bradford College will bring students from their English for Speakers of Other Languages courses to see Cinderella in January; followed by a back-stage tour. They will also participate in a workshop about pantomime as a form, with an introduction to panto as an English tradition and its cultural origins. The Start programme is proven to raise the aspirations of young people, building confidence and helping with learning and development in school. It also provides teachers with training for them to deliver the arts programme, helping pupils realise their full potential and making links to the curriculum.